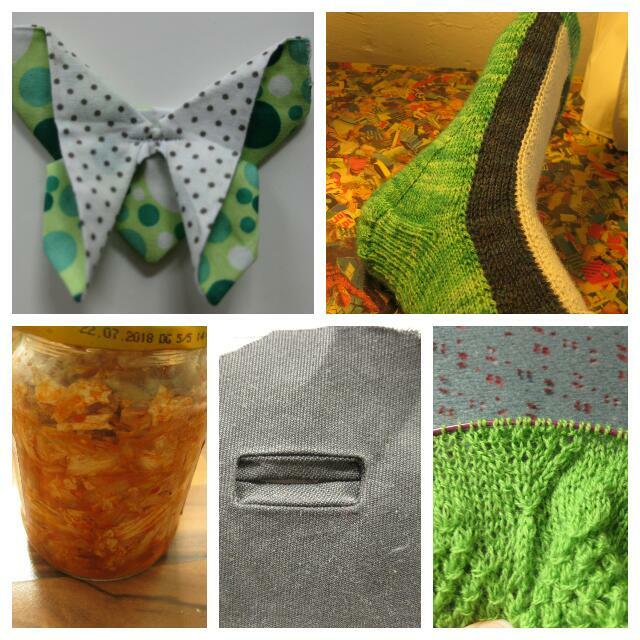 Welcome again to my weekly crafty round-up. This time a day late, but sometimes real live (aka my Doctor Who meeting) gets in the way. An exciting week, as I just published the pre-order of a MKAL I designed. I hope all knitters will have as much fun knitting up the shawl as I had while designing and knitting! Welcome to my new Mystery Knit-a-Long. The inspiration for this shawl is the comic book character Captain America. Tales of Suspense was a comic boom titel by Marvel Comics and its forerunner and featured sci-fi stories. After introducing Iron Man and heavily featuring Capatain America, the titel changed to Captain America with it’s number 100. 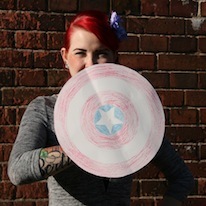 I even made a little Captain America shield for our photo shooting and the spoiler pic. The MKAL will begin with the first clue on April the 2nd, and the last clue will be published on the 23th of April. There will 4 clues in total and the last clue will be published just in time for the start of Avengers 2: Age of Ultron. The shawl will include textured stitches, lace, garter and slip stitches. There is one not too commen stitch in the third clue, but fear not, I already have a tutorial for it. Maybe you have your shawl finished just in time to see the movie in the cinema. I hope you all will have fun knitting and chatting! I can’t wait to see the first pictures and yarn combinations. Posted in Designs, Knitting, MKAL, Tales of Suspense and tagged knitting, MKAL, Tales of Suspense. Bookmark the permalink. I’m kind of amazed I manage to blog regularly, usually I’m already distracted by the next shiney thing after around a week. But this collecting things over a week really helps. I write things after/while crafting and then have one shiney new post once a week. 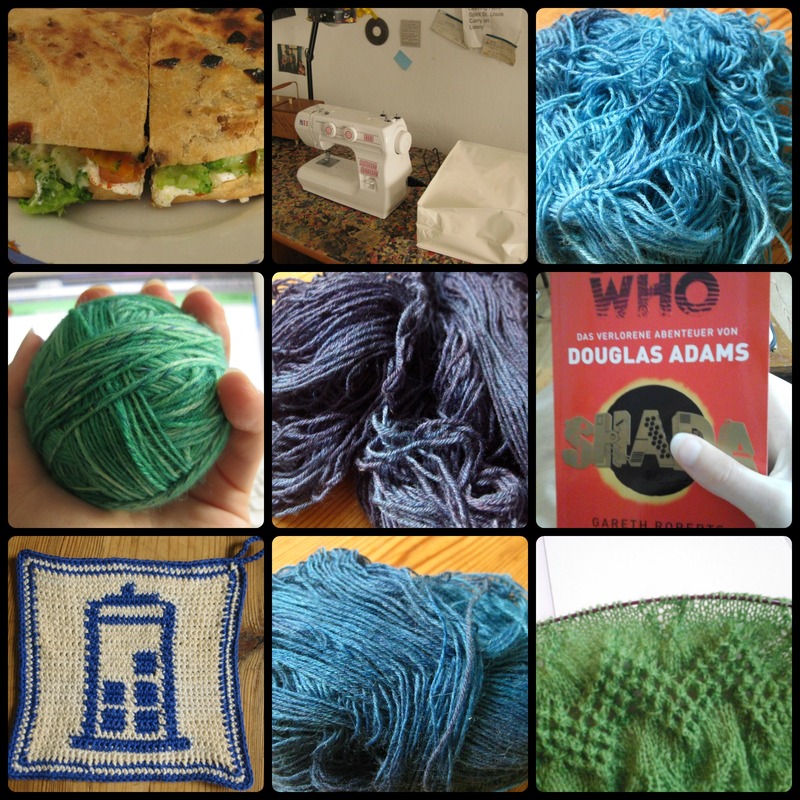 Posted in 7 days - 7 things, Food and tagged 7 things, books, dishcloth, Doctor Who, green, knitting. Bookmark the permalink. 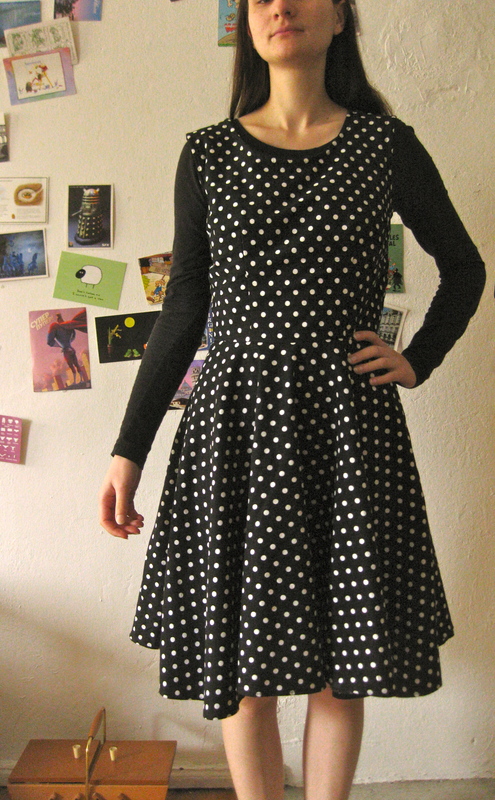 This was the firts dress I made on my sewing maschine. 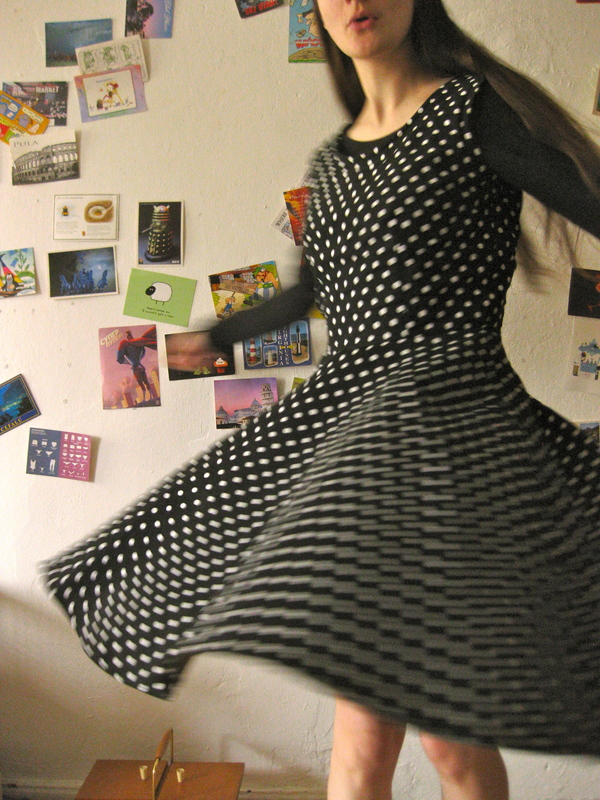 The firts thing ever was a similar skirt to the one on the dress from the same fabric even. The pattern is Vouge 8766 and if I ever choose the other skirt option and add sleeves, I could work up my own version of the winning dress from the first season final of the Great British Sewing Bee. The fit isn’t perfect, but then I have a tendencie to over criticises garments and accessories I made myself. I changed the skirt a bit, as a full circle is just to much, so 80cm less in the bottum circle. And I shorten it to end just around my knees. 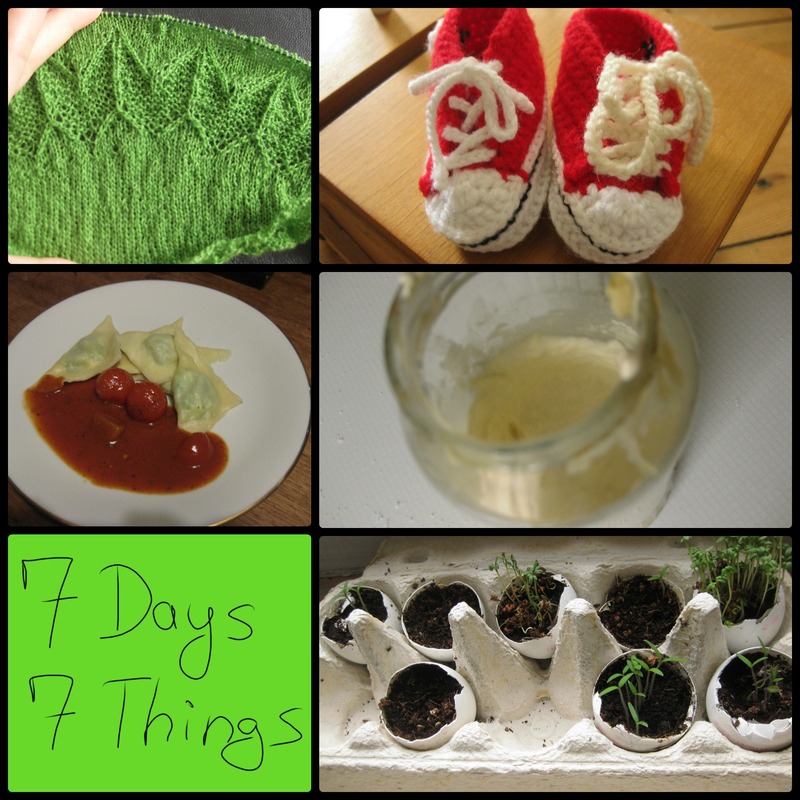 And here the second installment of the “7 days – 7 things” challenge. 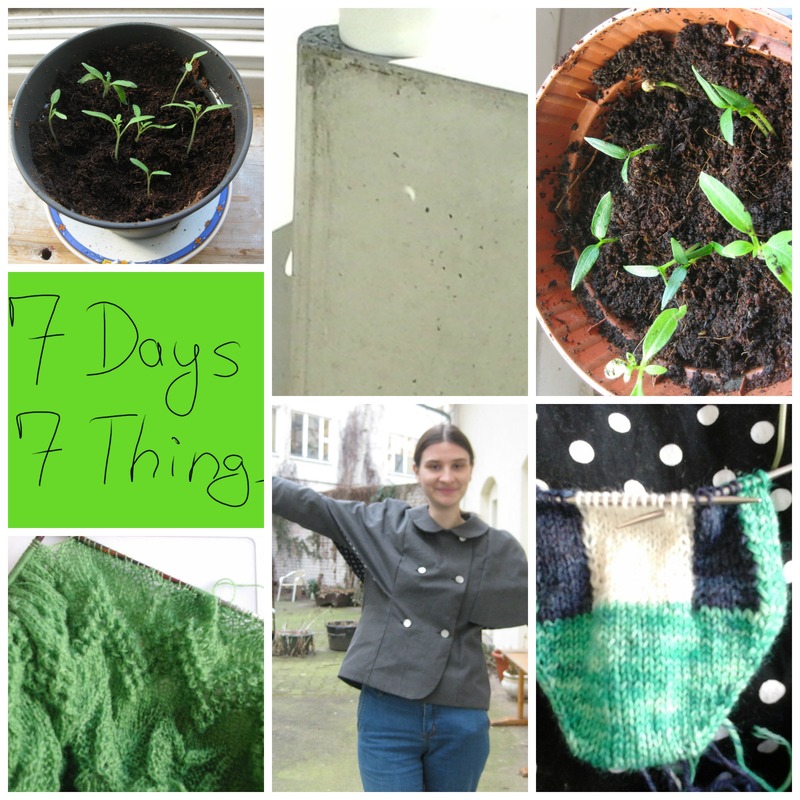 Posted in 7 days - 7 things, Design in Progress, Designs, Food, Knitting. Bookmark the permalink. Last year in May I bought a sewing maschine. Yes like I need another hobby. 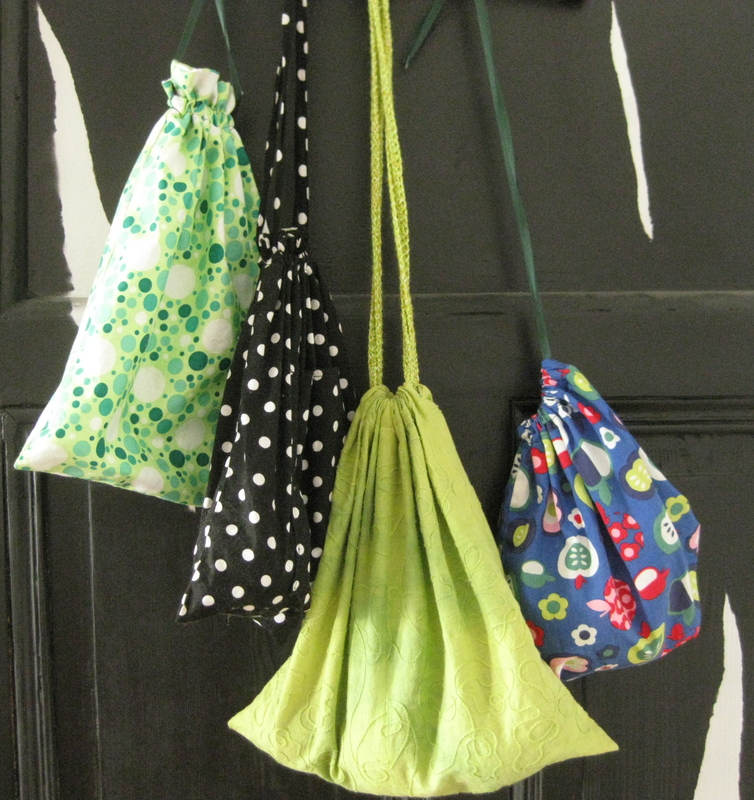 But nearly everything is knit related with me, so I made some project bags. Most are made from scrap fabric that was left over from the garments. Only the one with the apple-inside-the-apple fabric was a bag only buy. The one matching my coat is not pictured, that was a birthday gift for a friend, but it’s just a lighter shade of gray then the polka dot bag. Posted in sewing and tagged green, sewing. Bookmark the permalink.